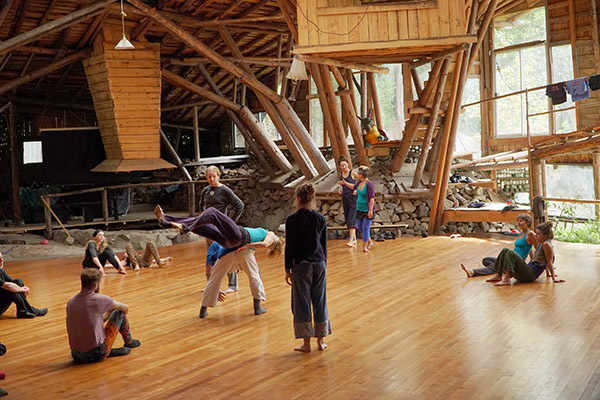 Mark Young founded and built Leviathan, a dance studio dedicated to contact improvisation on Lasqueti Island off the coast of British Columbia, Canada. Home to about 400 year-round residents with a passenger-only ferry connecting the island to the mainland, Lasqueti is one of the few places in North America a dream like Leviathan could be realized. This interview is part of Where Dance Is, a series of interviews with dance artists working outside major metropolitan centers. Tell me a bit about your history and how you came to found Leviathan on Lasqueti Island. I’m from Toronto originally. In 1997, I was in a car accident and my skull was fractured. When I woke up in the hospital, I didn’t know my name or where I was from. Because of the brain injury, I had no balance and my left leg was compromised. I started doing contact improvisation and tai chi as part of my rehab. A transient dancer friend who came through Toronto introduced me to contact improvisation about a year before my accident. After the accident, I was locked up in rehab and incredibly depressed, so I tried doing something fun and went to the local Toronto jam. The accident liberated me to go down a road I might not have otherwise. It quickly became apparent how fast and well I was recovering. The doctors were amazed and told me to keep doing what I was doing. There were up to 40 doctors and therapists involved in my treatment, so it was a large medical consensus. The accident was a million-dollar court case. I didn’t get paid a million dollars, but a lot of lawyers and doctors got paid. After the settlement, and when I saw how much I benefitted from contact improvisation, I became committed to building a dance studio. Five years after the accident, I headed for British Columbia, which had been a long-time dream. I was looking for a place to build a studio. I ended up on Lasqueti because there’s no building inspector. I wanted to build something completely alternative. The design is so unconventional. The trusses that hold up the roof, for example, are based on a design for a 12th century bridge in China called the Rainbow Bridge. I adapted the design. Most engineers work with right angles, post and beam, not arches, which require more structural engineering and math. That’s why I ended up in a remote place where I could build what I wanted. In another place, it might have cost a million dollars, but I built it by myself for $30,000. The studio is 10,000 sq. ft. and the dance floor itself is more than 2,000 sq. ft.
How is Leviathan run, and why the name? Leviathan means whale, gargantuan, or a large ocean-going vessel. In myth, it is a creature that eats whales, and there are also some biblical references to it. While I was building the studio, it looked like the ribcage of a whale, and the name spontaneously came to me. I run contact improv workshops, and I bring in teachers from all over the world. An important component of the programming is sharing meals together. After my accident, I developed allergies to dairy, wheat and soy. Going to retreat centers, I was often only served vegetarian options, so I would basically subsist on lettuce. That’s why I developed a studio with programs that include serving meat. Participants in the workshops often have similar food allergies. Compromised digestion is a common problem with acquired brain injury that a lot of people don’t know about. Sometimes people suffer from eczema or fibromyalgia without knowing it stems from a decades old concussion. I was speculating at first, because I developed these allergies right after the accident. Doctors told me they weren’t connected, but they looked connected to me, as I didn’t have them beforehand. I’ve since done research, and there is a connection. I hunt animals and serve bone broth, and there’s access to fresh fish. Vegans are cared for as well. People come to dance and be nourished with food. It’s more of a holistic healing center that way. The programs tend to be at least two weeks, though people often stay longer. Visitors commonly come from as far as Europe or China. Since people make a long journey, they want to spend a significant length of time here. Workshops generally have 25 participants with a staff of five for 12 days, so there are as many as 30 people on the premise. The staff are interns here to dance and work. Workshops happen from May to September. The rest of the year, it’s just me doing maintenance and construction. It’s too cold and wet in the winter. Visitors primarily camp in the summer, and the studio isn’t enclosed. Birds fly through and, in January, the cold wet fog. Can you tell me about the people and culture of Lasqueti Island? People here are fiercely independent who care for each other in times of need. There are 400 residents. Artists and retirees are common. It’s a cheap lifestyle. It’s all off grid; there’s no power, water or garbage pickup on the island. It’s a difficult supply chain getting food here. There’s a ferry, but it’s not a car ferry, so food must be carried off the boat onto the truck and to the studio. What are the advantages and disadvantages of basing Leviathan on Lasqueti Island? The obvious advantage is that there’s no building inspector, so I got to build something really extraordinary that I couldn’t build anywhere else. Another advantage is that the people who come dance here have made a commitment. It’s a one-hour ferry ride that doesn’t run every day, plus I’m at the top of a hill, so if you’re going to come to Leviathan, you’re really committed. It weeds out people in a good way. It’s not a drop-in center. 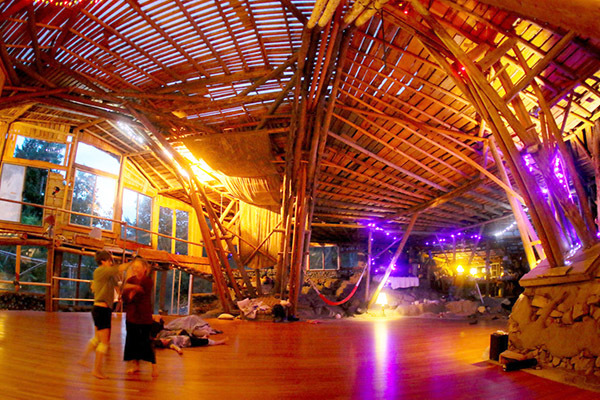 It’s not Burning Man where you can do whatever you want. It’s for dancers who want to seriously study. The disadvantage is the same. It’s hard to get to, so it cuts into the economics. The access issue makes it small and not for everyone. I’d love to host a Danceability session here, but the ferry and facility aren’t suitable for wheelchairs. Once you leave the dance floor, the ground isn’t flat. The studio has been operational since 2010 but it’s still not completed, and neither are the trails. What do you perceive is your impact? My biggest impact is providing the opportunity for sustained training within the world of contact improv. 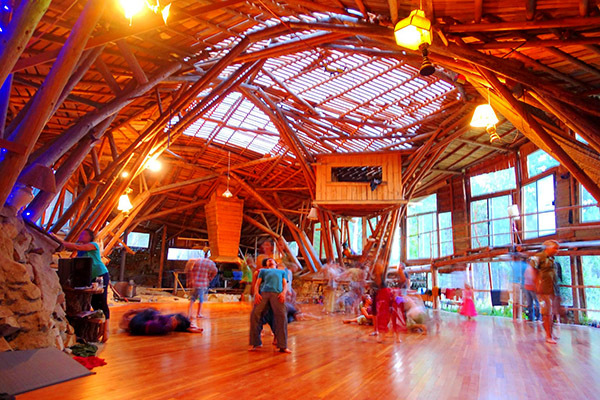 It’s not expensive to stay here, about $100 per day with meals included, and it’s often commented that Leviathan has the best dance floor participants have ever seen. I hear this from professional dancers. If you can get here, I can provide long and intense training. 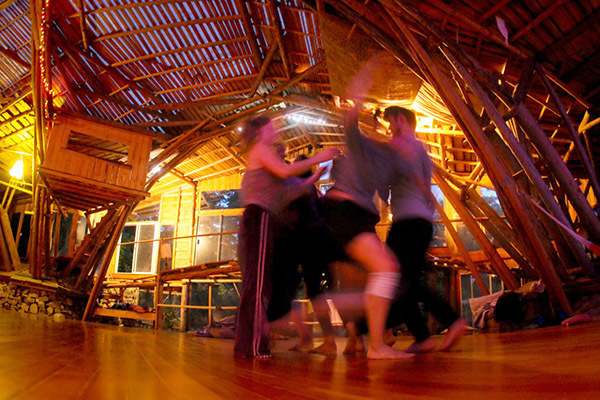 Fifteen people are spending six weeks here this summer dancing, in addition to participants for shorter amounts of time. I was recently asked to participate in the Brain, Body and Cognition conference held at Harvard. I don’t know how they got my name. Last year the conference was at Oxford, and I didn’t even read the invite, I thought it was spam. This year I was invited again. They really want me to come. Perhaps this is because I know something about the world of rehab. I got far better than I was expected to, and I attribute it to dance. Dance is different than any other modality. In tennis, for example, there’s tension and competition. In dance, you’re just playing. 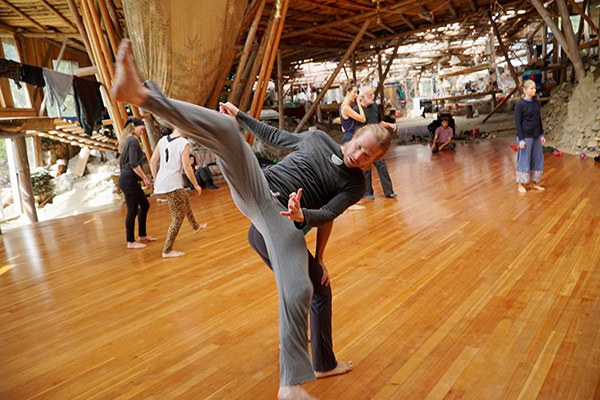 Contact improvisation is a great dance form in this regard. It allows the body to play. Even ballet or yoga can become very competitive but, when contact improvisation is done well, it’s just play. That essence of play is very nourishing and rehabilitating. It needs to be documented, so I’m looking forward to hopefully giving others some of the same benefits I received. To learn more, visit leviathan.lasqueti.ca.